Donald W. Powell | Carmichael & Powell, P.C. 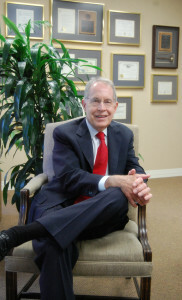 Donald W. Powell is a senior partner at Carmichael & Powell, P.C. He graduated from the University of Arizona with a bachelor of science degree in 1969 and a law degree in 1972. Mr. Powell is the past President of the University of Arizona Alumni Association, Phoenix Chapter, and a recipient of the Outstanding Alumni Service Award of the University of Arizona. He has served as President of the Bankruptcy Section of the State Bar of Arizona and President of the Bankruptcy Section of the Maricopa County Bar Association. He was Chairman of the Maricopa County Bar Foundation. Mr. Powell has been certified as a specialist in bankruptcy law by the State Bar of Arizona since 1987. He served as a member and examination reviewer of the Bankruptcy Accreditation Review Panel, Standing Committee on Specialization, American Bar Association. Mr. Powell has represented businesses and consumers in thousands of bankruptcy cases, and has confirmed 134 Chapter 11 plans of reorganization. His practice area is bankruptcy law.